This is Bleach Shinseina!!! The ultimate Bleah Role Playing Game!! Become Captain of your squad take over your universe!! Kill your greatest rivals and make new freinds along the way! » On the Knife's edge between life and death. » The Dragon of Hueco Mundo....Aizen's song bird. Hell is a place where Hollows are sent if their former lives were evil. 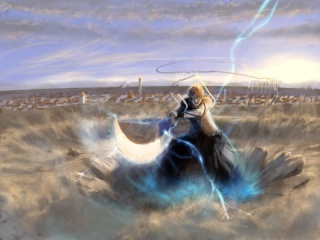 The Zanpakutō of a Shinigami can only cleanse spirits of the sins they committed as a Hollow. If the spirit committed heinous crimes as a Human, it will not be sent to Soul Society, but through the Gates of Hell. Soul Society (尸魂界 (ソウル・ソサエティ), the Japanese spelling used literally translates to "dead spirit world") is the afterlife (also called the spirit world). It is meant to correspond to Heaven or Nirvana in human belief systems. It is the place where most departed souls and the Shinigami dwell.